Recently at our annual partner conference, we talked about the opportunities for partners around key IT trends including cloud, virtualization and mobility. Cloud computing in particular seems to be a hot topic of conversation, on the minds of IT administrators and executives alike. And, just like your customers, you are probably trying to figure out how it will affect your business. After all, some businesses are adopting the cloud wholeheartedly, while others are taking a more cautious approach. Fortunately, cloud computing presents new opportunities for SMB partners to reach more customers than ever before. In order to see exactly what is going on with cloud adoption, Symantec conducted a survey of more than 5,000 organizations to measure the attitudes of businesses around the world and see where they are in the process of considering and implementing cloud computing. What we found is that while everyone is talking about it, there’s a lot of variance in terms of how far they’ve gone toward cloud implementation. The one thing everyone agreed on is the importance of keeping data safe in the cloud. The companies we talked to listed security as a top concern in moving their information to the cloud, with specific threats such as hackers, malware and data leakage constantly looming. Security is also a top goal among these survey respondents, and 87 percent believe that it will either have no effect or will actually improve data security once they do make the move. However eager businesses are to get moving, the fact is they are still unprepared to fully realize the benefits cloud has to offer. What’s the holdup? It turns out that IT staff is still unprepared to make the move. About half of them consider their staff less than somewhat prepared. The problem, it seems, is experience, with less than one-quarter of staff members having cloud experience. This presents a great opportunity for the partner community to both educate customers and assist with cloud assessments and implementations. 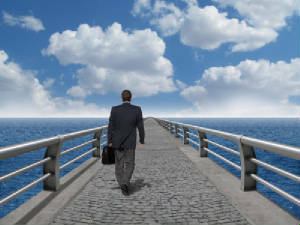 In fact, 75 percent of businesses surveyed are turning to external resources for help when implementing cloud solutions. Cloud computing is a nearly universal conversation topic within businesses. However, when it comes to “the doing,” the numbers paint a different picture. Three-quarters of organizations are at least discussing implementing some form of cloud, but fewer than one in five has implemented it in their infrastructure. This presents an ideal opportunity for partners to provide valuable assistance as more businesses look to make this transition. New technology expectations are often set unrealistically high by businesses implementing them, and cloud is no exception. IT managers report gaps between what they anticipated and what they actually achieved. For example, 88 percent said they hoped to improve IT agility through cloud implementation, but in the end only 47 percent actually realized the goal. This shows that the market is still maturing and that goals are ahead of reality at this point. Cloud computing represents a fundamental shift in IT operations, and you need to be sure you’re providing your customers with the right solutions. With the right preparation, you can take advantage of the opportunity to reach more small and medium businesses. As they evaluate how cloud computing fits into their businesses, you can take the lead and guide them through the process. With your help, they will be able to make the process as painless as possible. Help your customers determine tiers for applications to drive their focus as they allocate resources for the move to cloud. Assist your clients in evaluating and managing risks. Help them meet compliance and availability requirements in their industry. Provide sufficient education and training for clients to help them maintain security and efficiency. You can play a key role in helping your customers successfully move to the cloud by anticipating their specific needs as they make the transition, and offering support every step of the way. It’s just one additional way you can add value and strengthen those crucial relationships with your customers. Randy Cochran is VP of channel sales for the Americas at Symantec. Monthly guest blogs such as this one are part of The VAR Guy’s annual sponsorship program. Read all of Cochran’s guest blogs here. 1)Don’t come in with a 20 slide deck! 4)Give solid, real-world examples that are relevant to your listener.